Security tokens is a very young industry and is still trying to find its core identity. The early days of any groundbreaking technology trends are always marked by frictions between different school of thoughts that can send the market on one path or the other. To use some recent examples, the first years of cloud computing saw two main schools of thought collide: Companies like Amazon Web Services(AWS) focus on building pure infrastructure as a service(IaaS) in areas like storage or compute while Microsoft Azure and a group of startups, that no longer exist, lined up their efforts behind a service(PaaS) strategy focused on building higher level services. Ultimately, AWS proven to be more influential forcing platforms like Azure to launch their own infrastructure-as-a-service offering. Similar frictions can be found in the evolution of mobile apps with trends such as native versus HTML5 or even in the blockchain space in areas such as public versus permissioned blockchains. Even though we are in the very early days of security tokens, there are already very tangible friction points that are likely to influence the evolution of the market in the near future. Understanding the existing friction points in early technology markets is important because it help us to hypothesize about the evolution of the space. Historically, the frictions created in nascent technology markets have taught us some important lessons that might be applicable to security tokens. It is important to understand that these principles are for early stage technology markets and they don’t necessarily hold true in the long term. · Simple Beats Sophisticated: Early tech markets seem to follow the Occam’s Razor philosophical principle and favor the simplest solution to the first wave of use cases. In cloud computing, building IaaS was fundamentally simpler than PaaS( trust me, I know for experience 😉 ) and, in mobile computing, native apps were simpler than mobile-web apps. Simplifying the tech value proposition allow vendors to attract more early adopters in times in which a new tech trend is going to face the skepticism of the vast majority of the market. In the context of security tokens, the platforms with the simplest technological approach are likely to gain more adoption in these early stages. · Right in the Short Term Beats Right in the Long Term: Trends that proven wrong in the early stages of a tech market can become relevant as the market evolves. Going back to our cloud examples, Microsoft’s PaaS strategy resurfaced successfully after the initial fiasco and vendors like AWS or Google Cloud were quick to adopts it even when it represented a deviation from their initial path. However, unless a company is incredibly well capitalized, getting their go-to-market thesis right in the short term is more important than a long-term strategy. From the security token perspective, we might see highly sophisticated solutions fail to gain traction initially and become relevant once the market evolves. · End-to-End Beats Best-Of-Breed: In early tech markets, vendors that offer end to end solutions have a more viable path to market than specialized solutions. For instance, in the mobile space, the integrated experience of the Apple’s IOS stack with components like developer toolkits, app store and monitoring services resulted more attractive than standalone solutions in any of those areas. In the case of security tokens, platforms with integrated experiences for token issuance, listing and even capital raising have a better chance to achieve relevance in the early days. · Customer Acquisition Beats Network Effects: Early technology markets are, by definition, small in terms of adoption. In that sense, many of the network effects that we see in mature markets are completely irrelevant in the early cycles of a technology trend. In the cloud computing days, with the exception of Heroku which was acquired by Salesforce, most of the open source cloud stacks that focused on building developer communities failed against the customer acquisition machines developed by AWS and Microsoft. Now that we understand some of the dynamics that govern early stage technology markets, let’s extrapolate some of those principles to the security token space. If we analyze the relevant developments in the first year of the security token market, we can boil down every single one of them to some important friction between different market forces. In the current stage of the market, there are four key frictional dynamics that I believe will be highly influential in the evolution of the space. 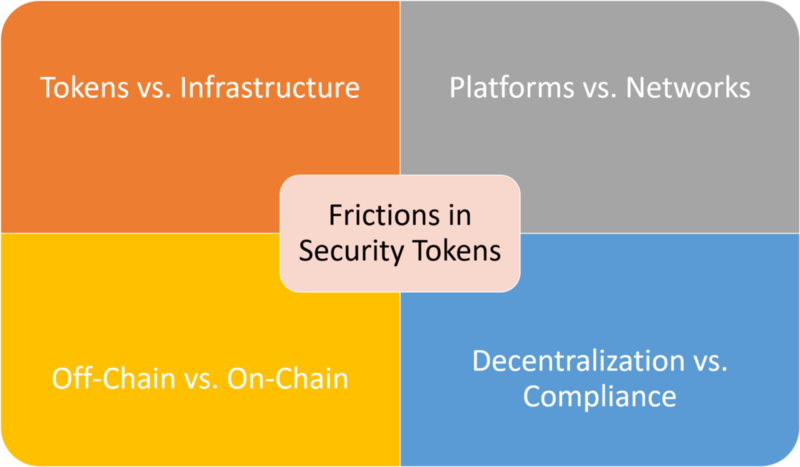 The friction between issuing new security tokens or building the supporting infrastructure is at the center of this nascent market. Many technology markets such as web or mobile computing were mostly driven by application use cases which, in turns, influence the creation of infrastructure building blocks. Other markets such as cloud or cyber-security have a heavier influence from infrastructure breakthroughs that trigger the creation of new applications. Security tokens seem to align better with an application-driven market but the balance is far from trivial. The issuance of new tokens is the ultimate experience of the evolution of the space and is likely that new tokens will influence the creation of new infrastructure for crypto-securities. However, there are only so many tokens that can be created without the right protocols of blockchain infrastructure blocks. The friction between infrastructure and tokens is, without a doubt, the most important dynamic in the security token space. Decentralization is one of the core ethos of the blockchain movement. A model that allow systems to trust math and cryptography instead of humans represents a major evolution in the computer science industry. However, that approach doesn’t necessarily work great for compliance and regulation. Conceptually, compliance implicitly involves trust on a specific entity to assert domain knowledge about specific rules. How can we reconcile that with a world in which decisions are made in the form of decentralized consensus? Security tokens were born to bring compliance to crypto-assets and, as a result, they might have to introduce some re-centralization of an absurdly decentralized ecosystem. However, that doesn’t necessarily mean that security token platforms need to be completely centralized solutions. Neglecting the decentralized computation model of the blockchain can be, in my opinion, the biggest harm that security tokens can inflict on the entire crypto-ecosystem. 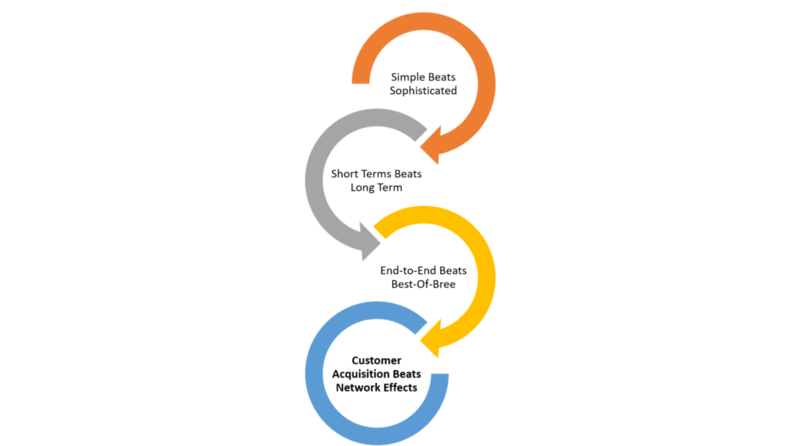 Traditional compliance needs to be centralized, programmable compliance doesn’t necessarily have to. Finding the right balance between decentralization and compliance is another existential debate facing the security token space. Complementing the previous point, many of the existing processes to issue crypto-securities take “off-chain shortcuts” in order to expedite their time to market. How many business processes in crypto-securities need to be implemented off-chain versus on-chain in the form of smart contracts? Abstracting different building blocks of security tokens in the form of smart contracts does not only natively leverages the foundations of the blockchain but also enables programmable interfaces that can be used in new forms of securities. While relying on traditional off-chain processes seems to be the right bet to take in the short term, programmable smart contracts hold the key to the future of security tokens. Currently, security tokens have evolved as a collection of isolated products mostly focused on the issuance and listing of crypto-securities. This approach highly contrasts with blockchain protocols that were mostly centered around the concept of networks of participants. Without a network, there are only so many protocols that can be implemented in the context of security tokens. Additionally, the absence of a network makes the security token market very vulnerable to incumbents entering the space. The value of network effects in security tokens is very obvious but the implementation is not. How can we build a network ecosystem of participant in the lifecycle of crypto-securities? In my opinion, achieving this is going to require new protocols and infrastructure building blocks. Many will argue that a new blockchain for security tokens will be the ultimate manifestation of a network in this market.